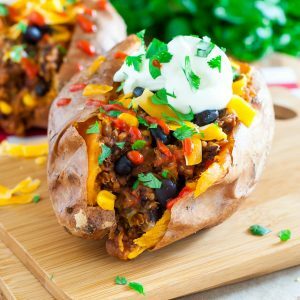 These quick and easy Chili Stuffed Sweet Potatoes are the perfect use for leftover chili! This gluten-free meal is easily made vegan, vegetarian, or t-rex! It’s time for another tasty edition of Loooooooove Your Leftovers! If I can help even just a few of my snobbiest of leftover snob friends out in the process, then I consider this one a total win. Our last leftover re-mix featured turning Taco Night leftovers into a deliciously speedy Taco Soup. Trust me, you’ve got to try it! The variations are endless and since we’re essentially making a taco soup out of all our favorite taco night components, it’s a recipe for success! I should note that I’m fighting the urge to abandon ship on this post so I can make one right now! We made another huge pot of chili Sunday because the last batch didn’t last nearly as long as I had hoped it would – we devoured it! I’ll hold out a few minutes longer so I can get this recipe into your face. Ready to stuff some veggies into veggies!? Of course you are! 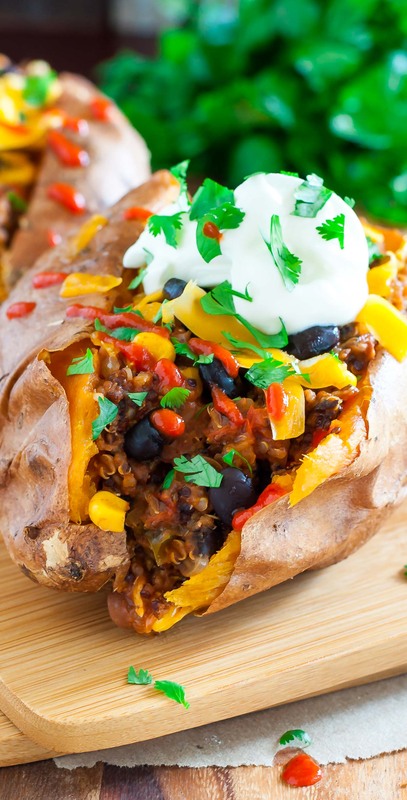 These savory stuffed sweet potatoes are a great way to use up leftover chili the next day! Make one for lunch or serve the whole family by turning this tasty dish into a sweet potato bar with all your favorite toppings! Microwave [or bake!] 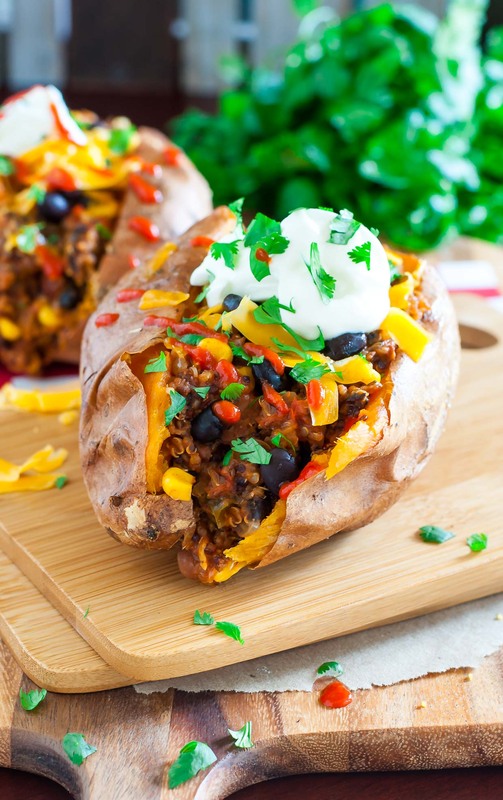 your sweet potato until it's hot and fluffy and reheat your chili. Slice vertically and pinch the sides to create a bowl in the center. Fill with a piping hot scoop of your favorite chili and pile on the toppings! Now grab a fork and dig in! I wrote out the instructions for one, but feel free to make 2, 3, even four of these sassy spuds! I typically keep all the ingredients on hand and have them for super speedy lunches throughout the week. They can also be prepped for grab and go work lunches! Let’s get a little up close and personal, shall we? Don’t forget the homemade cornbread! Ahhh I want one now! Now if you’ll excuse me, I have a date with a chili stuffed sweet potato! I’m not really a fan of stuffed potatoes, but stuffed sweet potatoes? Count me in! I’ll definitely have to make this over the weekend. You totally just made my night Tara! So glad you love the leftover posts because I have a few more planned! <3 Hope you're loving the chili - the leftovers were even better than the first day! Aw thanks Maureen! <3 Long live leftovers!